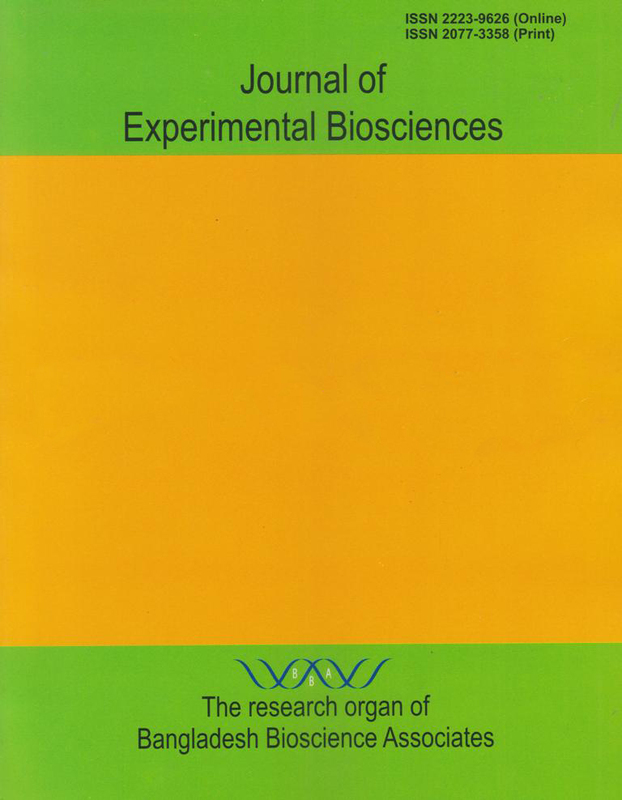 Article(s) must be original reports of research or review of research on any aspect of biological sciences not simultaneously submitted to or previously published in any other scientific or technical journal. 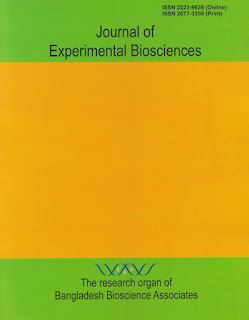 The research results reported should be applicable to an area of ecological or economic significance and of potential interest to a significant number of scientists and must make a significant contribution to the advancement of knowledge or towards a better understanding of existing concepts of biological sciences. The typical sequence for a paper is Title, Abstract, Introduction, Materials and Methods, Results and Discussion and References. Abstract should contain a short background, objective(s), methodology, main finding(s) and conclusion preferably within 200 words. Introduction should introduce the subject and contain background, importance, scope and short review, statement of problem, justification and objective of the research work. Materials and methods used in the research works and statistical tools or methods in analyzing the data should be described in details so that reviewers and future researchers can exactly use those. Results and discussion should contain the original hypothesis, observation, interpretation and limitation(s) of the present results along with recommendation(s). Discussion should relate new findings with the previous ones. Extensive discussion should be omitted. Christensen, A. H., Sharrock, R. A. and Quail, P. H. 1992. Maize polyubiquitin genes: Structure, thermal perturbation of expression and transcript splicing, and promoter activity following transfer to protoplasts by electroporation. Plant Mol. Biol. 18(1):675-689. Sampson, H. A. 1997. Immediate reactions to foods in infants and children. In: Food Allergy: Adverse Reactions to Foods and Food Additives (eds. Metcalfe, D. D., Sampson, H. A., and Simon, R. A.). Blackwell Science, Cambridge, p. 169-182. USEPA (United States Environmental Protection Agency). 1997. Terms of Environment. EPA175B97001. USEPA, OC, Washington, DC. A table (Max. size 7˝× 5.7˝) must have a descriptive heading (bold) above and should be self explanatory. The contents must be in 12 Fonts with no vertical lines except the horizontal ones above and below the leading row(s) along with proper statistical analysis. Figures (Max. size 7˝× 5.7˝) should be clear and self explanatory with a descriptive caption below (bold). The fonts of the legend(s) should be 14 while those of X and Y axes 12. Linking the Microsoft Excel data of the figure(s) in the soft form is appreciated. The figure(s) must not be in picture format. The extra cost of the coloured figure(s)/diagram(s)/photograph(s) /illustration(s) will be charged excluding those for printing and processing. Gram, Kilogram, tones, meter, cubic meter, squire meter, cubic centimeter, squire centimeter, centimeter, millimeter, per hectare etc. should be written as g, kg, t, m, cbm, m2, cbcm, cm2, cm, mm, ha-1, respectively. The manuscript should be submitted in duplicate; typed using ‘Times New Roman 12 Fonts’ of the Microsoft word programme on A4 size paper in double space, having the page set up of left margin 1″, right margin 1″, bottom 1″, top margin 1″ and gutter 0.5″. N.B: During each correspondence author(s) should always use the manuscript number provided by the Chief Editor and first author’s contact cell phone number along with email address. Authors will receive no reprints free of charge. The reviewing, processing and printing costs will be charged in case of print edition. Online publishing will incur no cost. The Journal is published in January and July each year. So, articles are to be submitted at least three months prior to its publication in print. For online publishing, articles may be submitted any time and it will be on ‘online’ after the necessary reviewing/editing is finished. N.B: Author(s) must abide by the ‘National or International ’copyright rules’. In case of its violation(s), Bangladesh Bioscience Associates or any of its authorities will not be responsible.